New Wilderness Project NW — CascadiaNow! Providing arts based educational programs in schools and transformational wilderness experiences for youth of all ages. The mission of New Wilderness Project NW is to provide arts based education programs in schools and transformational wilderness experiences for youth of all ages that grow their awareness and empathy across cultural differences, expand their capacity as powerful change agents for equity and social justice, and cultivate their stewardship in community and for the natural world. YES! Program: The Youth Equity Stewardship Summit consists of five gatherings designed to prepare middle and high school youth along with adult advocates from across a district to be powerful change agents in building inclusive, inspired school climates. The content combines live musical performance, structured dialogue, creative expression activities, and experiential learning. The arts-based curriculum is designed to build deeper relationships and connections across the spectrum of identities including (but not limited to) culture, race, gender identity, ability, age, belief, economics, learning preferences and academic history. All participants engage with the YES! workbook for processing their ideas and insights as they move through phases of the Youth Equity Stewardship Series curriculum. The series concludes with a culminating “Listen Up” community presentation of youth voices, and is followed by a strategic planning session with teachers to transfer the learning from the series into existing school improvement efforts. NWPNW gives access to YES! Programming to under-served students and even entire schools. Wilderness Program: The YES! 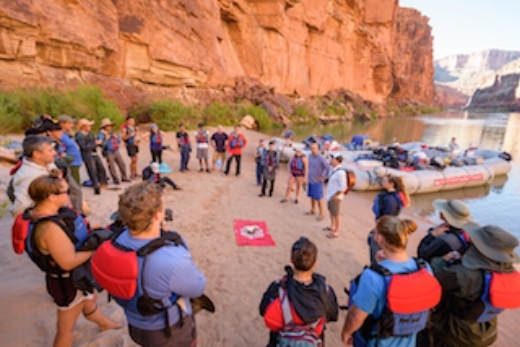 Wilderness Expedition is an eight-day river trip on the Colorado River through the Grand Canyon for high school students and educators who have participated and excelled in the New Wilderness Project, YES! series. The expedition is designed to be an advanced wilderness based skills training, empowerment process, and transformational experience for youth ambassadors who come from diverse socio-economic backgrounds and diverse regions in the U.S. who have already shown a deep capacity as change agents and social/ environmental stewards in their school communities. Through personal reflection, creative expression activities, structured dialogue, on-river community building, and experiential learning, ambassadors will grow awareness and empathy across cultural differences, gain concrete stewardship skills, learn about the history and ecology of the Grand Canyon, empower themselves as change agents and influencers, and grow a vision for taking action in their home and school communities. Through NWPNW scholarships, sponsorships, and partnerships, the goal is for this YES! Wilderness Expedition to be at little to no cost to the students. All gifts are tax deductible. Contact us to let us know if you would like to volunteer directly with this project. Benjie Howard is the founder and executive director of New Wilderness Project, a musical performance group and an arts based education program focusing on developing youth leadership for equity and social justice. He is the co-author of the Youth Equity Stewardship (YES!) curriculum and the lead Deep Equity consultant with Corwin Press. He is a touring singer-songwriter with 4 albums, including his collaborative 2015 release, BORDERLESS with Wade Colwell-Sandoval. He is the co-founder and lead songwriter for the Northwest based band Coldwater Collective. His first book of poetry, Separation Point is due out in 2017. Benjie is a river guide and wilderness educator on the Colorado River in Grand Canyon where he has been designing and leading educational expeditions for teachers, leaders and youth since 1995. Wade Antonio Colwell is a devoted Artivist & rising voice for deepening relations across generation and difference. A veteran educator, Wade engages the creative/cultural modalities of song, spoken-word, movement, ceremony and restorative practice. He is the co-founder of Youth Equity Stewardship (YES! ), an arts- based, experiential and inter-generational process of transformational stewardship of our school communities. His touring multi-media performance Borderless, with YES! Co-Founder Benjie Howard, is a folk & hip hop fused journey examining the intersections of race, class, identity, immigration, sexual orientation and gender while centering strongly in environmental & indigenous peoples' justice. He is co-founder/ MC of the pioneering academic hip hip duo Funkamentalz, national lead consultant with Corwin Press (Deep Equity and Student Aspirations) and the Restorative Practices Educator for NYC-based Counseling in Schools. Wade is also a founding poet laureate of Tucson Unified School District's Mexican-American / Raza Studies Department.